Stanley Dock Tobacco Warehouse is the largest brick-built warehouse in the world. This fact though does not really describe just how striking and imposing it is as it looms over the smaller buildings and now largely abandoned quaysides at the northern end of Liverpool’s old dock system. My own first memories of Stanley Dock were as a young child in the early 1990s when I’d regularly go with my family to the ‘Heritage Market’ held on part of its ground floor. The market was a bit of grassroots capitalism encouraged in the 80s by Liverpool’s brief Militant Labour administration after the building had shut as a warehouse. My dad liked to go to buy ‘second hand’ tools and my mum liked to buy meat joints that would be sold loudly by auction. I’d usually be kept placid by my parents buying me some form of plastic tat and a hotdog. The vast and decaying edifice, of which the market only occupied a fraction, fascinated me and I’d try and wander off to the abandoned bits, only to be dragged back. From a young age I absorbed from my parents and the wider community, the huge sense of sadness about so much of the waterfront area of Merseyside falling into ruin and abandonment. Especially from my dad who’d trained as a railway fitter just north of Stanley Dock at Bankhall workshops, before they, like so much else, closed as the dock system and related industry shrank from the late 1960s onwards. My mum’s family too had lived in this area on Boundary Street before they were re-housed to Norris Green. My parents were older than some and remembered Merseyside in the post-war boom era. I inherited their sense of the essential tragedy of the area’s subsequent economic decline and of the terrible impact it had on people and the area’s culture. That more things could have been done to mitigate it. As well as a hope, desire, need, that one day things would improve and not be in such decay. That there would be opportunities for people again, that Merseyside would once again be somewhere that attracted people from all over the world not lost them. The sentence sticks a little in my craw. I let it go, but I always remember it, the tension it caused in me. On the one had, who doesn’t love a party in an old warehouse? But then, to not realise that while abandoned buildings are fun and adventurous for some, for many more who walk past them every day, they’re not exotic or interesting or an opportunity. They’re tragic. Palpable symbols of decline, of lack of opportunity, of deep-rooted decay. And while a warehouse to rave in might be more fun than a conversion into mediocre flats, neither really solves the underlying issues such an area has. But hey, it is a party. I go back to dancing. As I grew older, I became increasingly interested in that hard question, what do you do with buildings, an area, a city, that has lost its original purpose? How can opportunities be created for the people who relied on a now vanished economy? Is it hopeless, will any planned urban change always result in worse outcomes for people already living there? Or is to just leave somewhere as it is to rot or be picked over even worse? Once, such questions were confined to certain regions of the world deemed to have ‘failed to adapt’, like Liverpool, who were often blamed for their own decline by the powers that be. However, in my relatively short lifetime such questions have, tragically, come home to roost for ever more of the UK and huge swathes of the Western world. A few years on again I find myself sat outside a now converted warehouse on Stanley Dock. It’s a beautiful sunny day and the new Titanic hotel bar has chairs on the quayside. The water in the dock glints in the sun. The sound of the reconstruction of the bigger, main warehouse across the dock carries over gently. I’m sat with a friend from a similar background who also remembered the Heritage Market as a kid and now lives in social housing nearby. We’re having a cold drink and talking about our experience of this building, how, as much as we enjoyed the market, most of Stanley Dock was barely used by it and was decaying around it. We both find the effect of sitting there almost surreal. While my parents never imagined all this could be ruined, we never thought we’d see this place no longer be a ruin. That was all we had known. I thought then of that person in the Biennial party. How our views would probably offend them. The ‘interesting’ decay replaced by refurbishment and re-opened for this development. But to me and my friend who both well remembered Merseyside at its nadir, to see this building well out from the centre of town restored, lively, well used, and employing people again, was pleasing. The alleged glamour of the ruin, much like the alleged glamour of poverty, is the preserve largely of those who haven’t had to grow up with it. But as Stanley Dock redevelops, it’s a prominent island surrounded by a series of initiatives, developments and grassroots initiatives which are increasingly attracting attention. Plans which suggest potential solutions to its industrial decay, but also raise thorny questions relevant to the further economic and social regeneration of Liverpool and further afield. Questions of power and place, creativity and capitalism, incomers and long-established communities. In this piece, I’ll touch upon them all, but focus mainly on the one closest to the hopes and fears in my heart, the Ten Streets. What is the ‘Ten Streets’? The Ten Streets are well, ten streets, from Saltney Street to Oil Street between the Stanley Dock complex and the edge of Liverpool city centre. Streets once dominated by dockside industries and warehouses when the nearby quays were bustling. The buildings on them are in varied states from still thriving use to total decay and abandonment. ‘Ten Streets’ is now also the name of plan for this area. Before there was a plan though, there was already change. The area had long been in decline. Although it retained a fair amount of small scale industry, a lot of this was slowly leaving for more modern business parks nearby. With land and buildings generally having low value, the area was increasingly derelict. So far so Western post-industrial world. And, like in many similar places before, including other parts of Liverpool, this combination of interesting old buildings, few neighbours, especially of an evening, and cheap rents brought creative people into the area. Make did look at investing in the area that had been their first home, Baltic Triangle. This had been developed over the previous 10 years as a creative industries area south of Liverpool city centre. However, as speculators moved into Baltic to capitalise on its new trendiness, this put Make off, as Kelly explains: “We looked in Baltic but because of the story of an area regenerating, there were buildings available, but they were landbanked and we didn’t want to do something temporary. We wanted a big fat lease where we could put down roots and make it sustainable. We didn’t want to repeat the same old, same old temporary use of space with no exit plan, eventually get gentrified out, wash, rinse and repeat.” So, having been introduced to a landlord in the area by friends at the Kazimier, they took over an old factory in the North Docks that had various times produced scooters and ambulance equipment. So, for quite pragmatic reasons, this industrial area started to gain a creative bent. The pursuit and use of ‘marginal’ urban space has been deeply linked to art and culture since at least the 1960s. What’s changed in the last ten or fifteen years is where the margins are, and how long they stay margins. As in other places, such spaces were once found right in Liverpool’s centre, symptomatic of its extreme decline that buildings were so cheap in the city’s heart in recent decades. As things improved and the centre regrew, what was the fringe moved further out. This a localised version of more extreme urban change in bigger and richer urban centres. This point from Claire is crucial when considering the role of the local authority and an SRF in the area. It’s worth touching on the related history of Baltic Triangle here at the other end of Liverpool, oft written about as Liverpool’s hip creative district. Baltic first began to emerge around 2008 when, with Liverpool’s pre Credit Crunch property boom and the city’s European Capital of Culture status, creative spaces such as venues and studios began to be moved on by re-development from the ‘Ropewalks’ area, which had emerged as the new ‘alternative district’ in the 1990s, itself partially deliberately engineered by the authorities since the late 1980s. Ropewalks had grown as the city’s older 1960s-80s ‘alternative district’ around Mathew Street was redeveloped. A familiar pattern, although with Liverpool’s sluggish economy, this was a slow process that took almost a generation to happen each time in those cases, so was much less noticeable than now. The Council and other authorities response to the issues of creative places in Ropewalks being pushed out was as it had been in earlier decades: ‘move to this new area’, which was named by the planners as ‘Baltic Triangle’ because it was, well, a triangle of land near the Baltic Fleet pub. Prior to that it was known as the ‘Waterfront Industrial Area’. I used to walk through it to my job in a call centre further down the docks when it was still very much a quiet, declining industrial area of small factories and depots. In fact, prior to its new creative status, Baltic was considered as being designated a ‘managed prostitution zone’ by the city. It’s important to note, as Baltic’s development has sometimes been written about as ‘wholly organic’ that in fact, it was both deliberately planned as a new creative district and that also there was also scepticism from many in the creative scene that it would work. ‘You can’t plan something like this!’ was the mantra. Some of the first creative outfits to move to Baltic were publicly funded outfits such as Liverpool Biennial, who were encouraged to go there. Importantly though, the Baltic Creative CIC was set up around the same time with funding from the now defunct Northwest Development Agency. This created studio space that crucially was directly owned and controlled by a Community Interest Company committed to creative industries and reinvesting any surplus generated in the area and supporting creative industries. This along with other studio space held by the likes of Elevator, led the development of Baltic as a creative district with others, notably venues like 24 Kitchen Street and Constellations, following. Crucially however, no planning framework was put in place at the time. So, as the district began to emerge as cool, Baltic was ripe to be picked over by property speculators and soon what were often poor-quality flats began to be thrown up, threatening the creative outfits in the area. Parry details the situation from the Council perspective: “I think what we realised with Baltic is that while it’s got a mixed land used designation, the feel with that is that it has become very residential dominated. What we have tried to do with Ten Streets is retain the employment focused designation to try and retain the job creating focus of the project. We’re keen not to get an imbalance where maybe the infiltration of residential in here becomes too much and the employment led focus of the project will be lost.” A SRF in the Ten Streets won’t prevent speculation entirely, but it will help a great deal. Close to the Ten Streets, it’s worth noting that neighbourhoods like the Eldonian Village are amongst the best examples of non-gentrification, community-led urban regeneration in the UK. For years Eldonian was the only place in the UK to have won a United Nations World Habitat Award. Yet this is rarely talked about, even in some of the architecture and urban studies press in the UK or the broadsheets. In fact, if Eldonian gets written about at all its often framed in contempt from the small coterie of quite privileged, London-based men who dominate such discourse: ‘The community rejected the visions in glorious concrete of architects, planners and theorists and built instead average looking houses with gardens. How bland. How dare they’ sums up usually how it goes. As a result, positive lessons to be learned from urban development in Liverpool, which also built the first ever Council housing and had some of the first housing associations amongst a range of other urban innovations, are often ignored by the wider country and world. Crucial in the lessons being learned with Baltic Triangle and Ten Streets is that, if given the attention they deserve, they could help influence models for areas dealing with the same issues much further afield. It’s worth noting here the distinctions between culture and regeneration in overheated cities like London and New York and in under-resourced ones like Liverpool which I wrote about in more detail here[iii]. While the former usually dominates urban discourse and the latter experience some of the same phenomena, the challenge for cities like Liverpool is in some respects the inverse. Rents are rarely a problem outside of a couple of popular areas. An average house in Liverpool costs 1% less than 10 years ago[iv]. The real challenge the city has is the same it’s been for decades, a lack of quality jobs. An issue which sees a shortage of training spaces for young people and more experienced residents piling on trains to Manchester every morning to work. The city loses its talent to the wider world and then further struggles to attract companies and good quality investment because of it. In fact one of the reasons so many poor-quality private flats have been built in Liverpool in recent years, has been that it’s easy money for low-grade local developers. While owners of land that’s been often fallow for decades are keen to cash in on it quickly. With the general low demand, developing space for businesses doesn’t offer the same returns. So new businesses can’t find enough space, while bigger ones stay away from investing and it becomes a vicious circle, especially with public spending locked down. A development such as Ten Streets, if managed well, could help provide for the growing demand for creative business space and the people who use this space in turn support arts venues. However, such space must be free from predatory speculation, both for the creative scene and more pragmatically because the city desperately needs space for the new jobs being created. I had several positive social media conversations with Jake from Dumbells about the Ten Streets and their venue, but we could never quite make an interview happen. In short though, Jake was keen to point out they had arranged the meeting with Claire and that it wasn’t them, but some of their concerned patrons, that started the petition when the plan came out. The focus of the discussion and plans of Ten Streets have been the former warehouses and factories adjacent to the docks. While some people do live in the immediate area, it’s always been principally industrial. Not far away though are residential districts that once relied on this area for their economic life. Vauxhall, Everton and Kirkdale are amongst the most historic districts of Liverpool, some of the most deprived parts of the UK and at the heart of where the idea of Scouse culture was born. These areas have faced challenges with poverty since the industrial revolution and growth of the low wage, insecure work culture that dominated this part of the city of docks, processing plants, warehouses and ship repair. This has only been exacerbated though since these industries fell into decline. Liam Naughton reflects on the past of the area: “That golden era when everyone had a job. Not that long ago. Every building thriving with work. The docks were active. That’s not happening at the moment. But you can bring some of it back.” While some fear economic development, most people in north Liverpool with its high unemployment and low wages, need it. The question is though, will projects such as the Ten Streets provide jobs for local people? While the Ten Streets is the focus of this piece, part of the deeper interest in this area is how it is surrounded by other developments of very different kinds. On one side the award-winning Eldonian Village mentioned earlier and adjacent the already started redevelopment of the Stanley Dock complex. Different again over the dock road is the long planned but slow to progress Liverpool Waters scheme on abandoned quaysides by property giant Peel Holdings, which promises modern flats and offices. Then at the northern tip of this, Everton FC are proposing a new stadium. If even half of these plans completes, it will be the biggest impact on this are since the rapid expansion of the dock system in the Victorian era. How will all these varied developments sit together? I’m similarly a supporter of the new ground, especially as one of the world’s great stadium designers, Dan Meis, is working on it. Fandom aside, a high-quality modern stadium would be a great asset in such a football obsessed city and could be a catalyst for further development of the whole area. Especially as the planned stadium site is adjacent to a sewage farm, so isn’t likely to be developed for much else. However, as I’ve seen no less than three Everton new stadium plans collapse in my lifetime, I’ll believe it when I see it. Furthermore, very careful planning will be required to integrate it with all these other planned developments. Where will this money come from, given the Council’s lack of cash? The plans for Ten Streets represent both Liverpool and wider ideas around culture and urban regeneration at an interesting juncture. For Liverpool, it’s a sign the regeneration that’s been going on nearer the centre for some time is now, for better or worse, moving further outward. Even as Merseyside’s economy remains generally weak, it trundles on in a broadly upward direction compared to the situation when I was a child in the 1980s when it must not be forgotten, to many people it seemed like the area was in terminal decline. As public authority was sucked out of urban development, property developers took the power and initiative. The likes of London’s Docklands and Liverpool’s Albert Dock were examples of public money priming private development driven by powerful, unelected development agencies. In the UK today, such public funds have largely dried up and the development agencies have shrunk or disappeared. At the same time, deprived local authorities have long since, through desire or more often force, coshed by successive Governments to follow the Neo-liberal approach of Manchester, adopted many of the former development agencies’ ideas. The vast overwhelming reduction in central Government support for local authorities has made every city in the UK think about how it might pay for itself, especially given how low and weak local taxation is in Britain. At the same time as these power structures have shifted, so too has the view of ‘what works’ in regeneration and re-development. The ‘post planner’ era 1980s schemes were amongst the first to start to value old industrial buildings, but still favoured large scale re-development aimed at large businesses occupiers and private housing. Arts, small business, the grassroots and ‘alternative’ were usually seen as a problem to these schemes, or at least something to be ignored. However, as such developments proliferated, middle class tastes began to shift towards the ‘small’, ‘authentic’ and ‘varied’, against the ‘soulless’, ‘bland’ and ‘corporate’ just as they had done against the Modernist schemes of the 1960s. Developers and planning departments began to increasingly realise the benefits of having certain types of small, independent businesses in areas, retaining cultural venues, the pull of things like street art and ‘just enough’ rough and readiness that made an area ‘interesting’ and developments started to change shape. Sharon Zukin in her seminal Loft Living: Culture and Capital in Urban Change, captured the role that arts and culture and artists, or more broadly, humanities graduates, have played in changing declining industrial areas. Often bringing back into popular use buildings, even districts, that had been deemed beyond saving and only suitable for demolition. Coupled with the emergence in the belief of the creative industries as traditional industries declined, this was increasingly piggy-backed on and facilitated by developers. As well as local authorities, which critics from the biggest metropolitan centres should not forget were, in many cases, desperately trying to find ways to keep their towns and cities alive. The speed and scale of such inner-urban change in the UK increased in the pre-2008 boom and indeed carried on in an even more unbalanced way after the Crunch as the power of the public sector was crushed and ever more organisations were pushed towards market-based thinking. Concurrently, the reduction in social security and traditional secure jobs for humanities graduates in colleges, charities and the public sector, pushed more of them also towards market-based thinking, setting up as sole traders or working in small businesses. As this happened, the issue of being disrupted through studios and venues being redeveloped became even more of an issue. Especially as the speed at which this happened seemed to keep increasing and in some major metropolitan areas, space became more of a premium. Once young humanities graduates may have done ‘radical stuff’ in old warehouses or similar for several years, with little thought for the long term. Sustainability didn’t come into it, because surely the revolution was around the corner? When that didn’t come, most just moved on, getting a ‘proper job’ once they began to settle down. Increasingly though, those ‘proper jobs’ no longer existed, or at least in fewer numbers and far less lucrative than before. What was once the temporary action of the young increasingly became something that had to be framed within longer term thinking. Developers and authorities have come to realise that crushing the creative aspects of an area can negatively affect the economic and social regeneration benefits they seek. Creative people too are now more aware than ever of their role in such urban change and indeed in urban life in general and what they bring to it. More aware also of the need to work to protect space and of their relative lack of hard power, even if they punch over their weight with their soft power. Similarly, while they themselves can often be exploited, creative people from more comfortable backgrounds can no longer be oblivious of the impact a developing ‘creative scene’ can have on impoverished and under invested neighbourhoods and those that have long lived in them. We’re now in a mature phase when everyone, from artists to music fans to planners, developers and politicians, should be aware of the potential and pitfalls of inner-urban regeneration related to creativity and the arts. It is in this context that The Ten Streets emerges. While it retains some traditional industry, this will never again grow back in the same way. Thus, this huge swathe of industrial buildings need new uses or face crumbling to dust. In a booming city, this would probably involve a simple conversion to residential and offices, with plenty of private capital going in because of the obvious return. But Liverpool presently has a limit to the number of flats and offices it needs and the margins on them are low. As stated earlier, it must be remembered that Liverpool is not an overheated city like London, New York or even Bristol. While theoretical discourse around art and urban change is dominated by looking at such places, the context for Liverpool and cities like it is quite different. Liverpool City Council knows well more than ever the truth that many choose to ignore: unless the city develops its economy more, creates better jobs and increases its tax base, it will always be at the mercy of the coming and going of external grants on the political winds to provide the services its people needs. It will continue to lose to many of its talented people and it won’t give its young people enough opportunities. Liverpool’s economy isn’t big enough to develop on its own and needs intervention, but the city has limited financial room to manoeuvre. As grants have been slashed, it’s often at the mercy of the interest, or lack of, external private capital, to develop. Meanwhile, the city is under internal and external pressure to preserve its historic districts, which is very expensive and increasingly hard because of the low demand for property and the slashing of grants. There’s no single solution to all this. Even while a change in Government may help things, it wouldn’t in itself solve the area’s long-standing economic issues which have their roots before WWII. At the same time Liverpool, always noted, at least by those without prejudice, as an interesting and often radical cultural city, has much potential. It’s now a major centre for cultural tourism and its artistic output is growing in scale and recognition. However, this, like in so many places, has constantly been undermined by property speculation, short-termism and poor planning. Local authorities which claim to care about culture and the arts, in the Liverpool City Region’s case claim to have it at the heart of its focus, can no longer stand idly by when important cultural facilities are decimated in favour of poor-quality developments which, in some cases have shady origins and never get built anyway. Liverpool is currently far behind in the stakes of getting big firms to move in. This kind of large-scale inward investment is important, not least in reducing unemployment in fell swoops and creating large enough numbers of training places for young people. However, it’s also problematic as big firms often come and go again, as Liverpool has learned to its cost. Encouraging smaller scale creative businesses, based around existing assets and organisations, can be a more sustainable model for economic development. There’s a real opportunity for the city here, but Liverpool has missed the boat more than once in recent decades. In the 1980s it had one of the biggest computer games design clusters in Europe, something that if nurtured may have transformed the city. But the Council navel gazed and never built on the opportunity. Much of it has since left. Similarly, as one of the most location filmed cities in the UK since the 1980s, only now, after many other cities have already done so, are we seeing the development of proper sound stages. Will Liverpool be able to take the opportunity presented by Ten Streets and build on it, generating more jobs in the creative and related industries, or will it squander the opportunity again? Ten Streets represents an opportunity for the city to do something different in urban development, in keeping with the city’s often radical history, rather than chasing generic ideas from elsewhere with increasingly diminishing returns. With Ten Streets it’s clear that different voices are around the table and there’s some positive feeling about working together. Different people have different agendas, but the redevelopment of this area, if done well, could benefit all of them and benefit Liverpool far more than if it remains as it currently is. Whatever vibrancy exists in pockets, there is also plenty of dereliction that is beyond most grassroots initiative’s capacity to change. Not to mention the lack of infrastructure in the area. Ten Streets has the potential to seriously revive these streets as an economic area and offer space for the long term for the arts and culture scene in the city. It could make money for those that invest in it, create jobs and restore heritage. However serious notes of caution must remain. It could just as easily go wrong and alienate those who are currently putting so much energy into it at a grassroots levels. A creative district wholly managed by the local authority, both the Council and artists admit would likely not succeed. Equally delusions about ‘just leaving’ the ‘organic’ development, essentially a lassiez-faire attitude, will only lead to the same driving out of creative outfits as the speculators move in, as has already happened in other areas of Liverpool and elsewhere. Thus, the Spatial Regeneration Framework, protecting the area in planning for employment use and restricting building heights, so making speculative residential developments less likely, could be key to seeing Ten Streets grow as a creative area. Such restrictions may also hold land values from skyrocketing. However, that isn’t guaranteed. For Ten Streets to work though, it can’t just be done on trust, even if it does currently exist between the different parties involved, as the power imbalances remain huge. From hand to mouth creative outfits to impoverished local authorities and private developers with mixed records. The SRF will help, but more needs to be done. Protected land ownership is the next step. While it might not work for the whole of Ten Streets, if certain key streets or buildings could be passed to a Community Interest Company, as in Baltic Triangle, this would give a core base of locked in spaces for creative outfits and venues. However, the risk with this is a CIC would lack capital to secure space against bigger developers, so it would need some form of significant public financial backing to start it off, best leveraged by the City Council. Beyond this, a formally constituted board with equal voting rights for all members and actual clout on planning matters covering the area, could help formalise the relationship between the stakeholders. Such a group would have to be more than ‘advisory’ for it to have real teeth to protect and steer development in the area in the right direction. This could include looking at implementing rent controls in part or in whole in the area. Such a model could see the CIC as a lead ‘developer’ in the area, generating rental income to keep sustaining and investing in more creative space. Yet at the same time leaving room for other initiatives to set up and operate in other buildings within a wider protective framework governed by a formal area board. Combined with the SRF, these things could make Ten Streets a potential model for other places dealing with the now well-established cycle of post-industrial to creative. If successful, it could attract artists being displaced from elsewhere, helping the city grow. The Ten Streets area being vibrant could help the larger developments nearby attract residents and other forms of business whilst keeping this area protected. While in turn such larger developments will help drive infrastructure improvements in the area beyond the scope and scale of Ten Streets. Another paradigm needs to be considered though. Time and time again areas like this around the world have redeveloped, for the most part by creative people from middle and upper class backgrounds moving into them, but often they have ended up being cut off from the residential districts that were innately connected to such industrial areas and which suffered greatly when they shut down. A re-birth for the old warehouses of the Ten Streets will be great for Liverpool, but it will retain a terrible emptiness if this area thrives with artists and creatives from Liverpool’s comfortable suburbs and further afield while Vauxhall, Everton and Kirkdale continue to struggle. Much is made of the exclusiveness of certain private residential developments, while ignoring that creative communities can, even if inadvertently, have an exclusiveness all of their own. How can a redevelopment like this be leveraged to generate opportunities for local people as the growth of the dockside industries once did? It is incumbent on the local authority to manage this, but creative and other organisations must also do their bit, and indeed there are promising signs of this in Ten Streets. Any CIC or formal board with power in the area could have baked into its constitution that creating opportunities for residents in north Liverpool was part of its remit as well as protecting and developing creative spaces and restoring heritage buildings. While residents and community groups from these neighbourhoods should also be part of any area board and help steer its development. At the heart of thinking about Ten Streets and other developments in this area, are questions of ownership and power. Who owns and who is responsible for such declined urban space? Property owners? The local authority? Developers who invest in it? The artists and creatives who’ve moved there? The established industrial occupiers? Or nearby long-time residents? There’s no one answer, though the power is as ever skewed to the developers, with local authorities, perhaps once the most powerful, now weaker than ever. Artists have soft power, but that is easily overwhelmed. Established residential communities may have numbers and longevity, but they have had their resilience battered over the years and need more economic opportunities. Everyone has a stake, everyone wants it to work, even if for their own reasons and some compromises will be inevitable. Can the structures be created and resources found to make it happen in the right way? Ten Streets marketing talks about Ten Big Ideas. Really, for this area to be successful and sustainable, it just needs one big idea to work. That is to put formal structures and ownerships in place to give its mixed stakeholders a real say and control in how it develops. Not leaving it to chance or the whims of private developers. Ten Streets is just small enough to get some people with power and money to be bold and innovative, just big enough to test if it actually works. To help create a real and long-lasting creative district and in turn encourage some more inclusive economic growth. Perhaps in ten years I can revisit Stanley Dock again and see, not just a nice hotel where I can get a drink, but a restored building at the heart of something thriving and far more powerful. That is the kind of cultural urban regeneration we need to dare to hope for, but it is one that will only be achieved if those with the power keep listening, are brave and don’t lose sight of their big ideas. 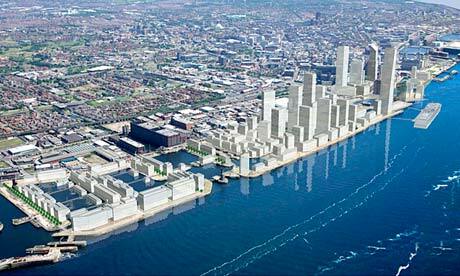 Liverpool Waters, a brighter future? After nearly a year of waiting and without warning, it was announced this week that Eric Pickles, the communities and local government secretary, would not be calling a public enquiry into the huge Liverpool Waters redevelopment of Liverpool‘s central docks area. To an extent this was always something of a foregone conclusion. With the coalition Government obsessed with economic growth and the regions ‘standing on their own feet’ it would have been hugely damaging for them to have been seen to be blocking the development. This was especially true with the plans having such strong support locally and the Government having already awarded the area Enterprise Zone status. This despite the concerns of English Heritage and UNESCO who have suggested that the plan could jeopardise Liverpool’s World Heritage Site status. On the contrary, people living next to the central docks know better than anyone what a general eyesore they have been for most of the last 40 years and the desperate need that Liverpool has to gain more jobs and a stronger economy, especially in the face of devastating public sector cuts. To recap, Liverpool Waters is a massive redevelopment of Liverpool’s dockland between the city centre and the still active modern port. 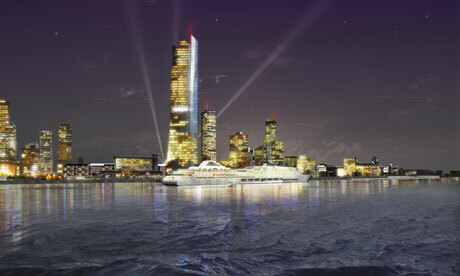 It is huge in scale, up to 1,691,000 square meters, which it is planned will include offices, homes, cultural facilities, retail and leisure provision and a second, larger cruise ship terminal. It has been suggested it could create as many as 17,000 jobs, have up to 23,000 apartments and four hotels on what is presently, for the most part, flat Brownfield land. 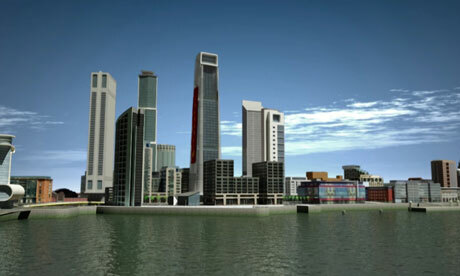 Its centrepiece would be the ‘Shanghai Tower’, at 55 stories the tallest building in the UK outside of London. With a scale like that, there are legitimate concerns about who will fill that huge amount of space. Especially when there is a fair amount of unused Victorian office buildings in the city and when Liverpool has a relatively poor, if slowly improving, economy. The developer Peel’s argument is that the sheer scale of the plans will attract foreign direct investment in a way that piecemeal development would not, and that many of the older buildings in the city are not suitable for modern office accommodation. Similarly heated debates were made about the Liverpool ONE retail development, with many commentators suggesting that Liverpool’s poor retail market could not stand any more units and that Liverpool ONE would destroy the city’s existing retail areas. While there are indeed empty units in Liverpool, as there in most of the UK’s cities and towns, the destruction of the older retail areas hasn’t happened and the critical mass of the transformative development shoved the city back into the big league of UK retail centres, from 14th to 5th place in three years. New occupiers continue to move in, even in the current depths of retail recession. What has also been consistently ignored by critics dazzled by the glass towers in Peel’s admittedly brash artists’ impressions is the solid economic development work underway in relation to it. A huge new container shipping terminal is being built in Peel’s modern Seaforth docks just north of the scheme. It will be the first one in the north of England capable of handling the new, larger container ships that will fit through the widened Panama Canal from 2015. With road transport costs increasing and the UK’s markets shifting from Europe to the wider world, there’s huge potential for the city to reclaim its place as the north’s premier port and create a large number of jobs in the process. A new Maritime College is already under construction on part of the site to help train young people for this. Meanwhile, over the river Mersey, Liverpool Waters’ sister project, the Wirral Waters redevelopment of the Birkenhead dockland is also significant. It’s actually even larger in scale than the Liverpool plan, but with it not being in the World Heritage Site, has attracted a lot less media attention. About to begin construction there is the International Trade Centre, a new business start-up hub for foreign inward investors that is the first of its kind in the UK and one of the biggest in Europe. It alone has vast potential to attract new investors from growing countries such as China, India and Brazil which are looking for a route into Europe. Once they become more established, they’re likely to require more space and suitable accommodation, leisure and retail space to support their facilities, and the Liverpool and Wirral Waters plans offer that. More recently, also at the Wirral Waters site, Peel has announced a manufacturing park, with plans to capitalise on the booming motor industry on Merseyside and possibly also expanding manufacturers in the energy and railway rolling stock sectors. The heritage arguments against the plans are something that many people local people have struggled to understand when most of the development site is literally flat. The main argument from UNESCO seems to be that the new buildings would detract from the older ones up the river, which has also been suggested with London’s Shard. This may be true, but I haven’t seen the queues for the Tower of London getting any shorter recently. The other crux was the archeology of the site, where they have a stronger point. Yet without development, the archeology will remain there unexamined until someone comes along with the money to dig it up. To leave the site in its present state because of what is possibly buried underneath it would be folly. No doubt the architecture critics will be sharpening their knives to criticise the scheme. Again, they may have a point. 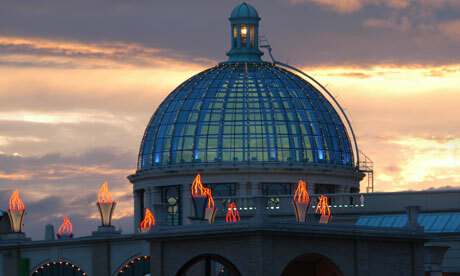 MediaCityUK and The Trafford Centre, Peel’s successful developments in Greater Manchester, are not beautiful. Yet they did restore redundant industrial land to productive use and have created thousands of jobs. And that will carry more weight in the deprived parts of Liverpool than hand-wringing about aesthetics by a few people who live far, far away. However, Liverpool is a city that loves its heritage and most citizens will hope that Peel will keep its promise that what historic structures there are in the development site will be restored and re-used. The group has a decent track-record in this already, spending money in the last couple of years to restore the historic but unlisted Bascule Bridge and dock police hut on its estate, which had been left to rot for decades by its predecessor, the Mersey Docks and Harbour Company. It remains to be seen if they will restore more. I have no doubt though that both the council and Peel will fight to retain the World Heritage status alongside the development if they can, not least for the pragmatic reason that it adds significant marketing value to the area. So, when is all this going to happen? That’s the big question. Those suggesting that the whole thing is pie in the sky should consider why Peel would have spent several years and millions of pounds on planning and preparation in the middle of the recession if they didn’t have serious intentions. It is true, however, that the time scale is a long-term one. Almost certainly the first elements will be the ‘business generator’ ones on the fringes of the developments. The post-panamax terminal and the International Trade Centre are under construction or about to commence. I would expect a start on the manufacturing park in Wirral as well soon, and with Liverpool’s cruise business growing, the second cruise terminal could start in the next few years. With these in place, then we can expect the first leisure and retail development to support the area and the first offices going up in the central part of Wirral Waters and just north of Liverpool city centre. All this will probably take at least 10 years to complete. The ‘second cluster’ of tall buildings further north, which was the real bone of contention with UNESCO, not the Shanghai Tower as some commentators have suggested, are unlikely to be built within the next 20 years. An International Festival for Business is being held in Liverpool in 2014, a large part of it on these very development sites. This will no doubt see a big investment push by the city and we may see the breakthrough of the first few key deals in relation to these schemes. Certainly the citizens of Liverpool will be hoping so. Now, the ball is in Peel’s court to prove they can deliver. The city council, the Government and the majority of people in Liverpool have endorsed the plans. Peel Holdings, it’s up to you to show the city that you can do more in Liverpool than create shiny pictures of a better future. This piece appeared on The Guardian in March 2013.